Tests. Papers. Long hours at the library. Study Groups. Class. Lab. Class again…sigh. Work study job. Part time job. Family responsibilities. This is the life of today’s college student. Because community colleges have open admissions, are close to home for many students and are cost effective, many students are opting to attend a two-year college in lieu of starting their college careers at a four-year college. Community colleges also enroll more part-time students than four-year colleges. In addition, most students in community colleges may be first-generation, low-income students, and many may be adult learners. Community college students are also more likely to work part time or full time while pursuing their studies. With students having so many obligations, sometimes, they neglect going to class and fall behind, which as a result leads to high rates of absenteeism, poor grades, apathy towards academic coursework, academic probation and academic suspension. 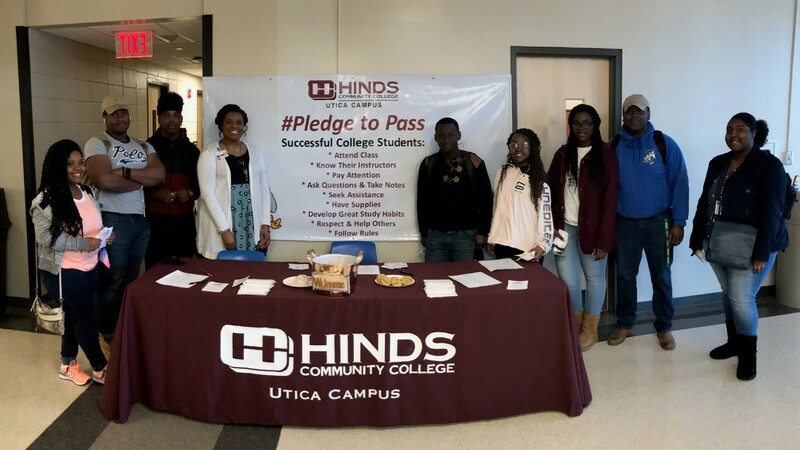 In an effort to encourage academic success at the Utica Campus, Instruction and Intervention Equals Retention and Graduation hosted a “Pledge to Pass Campaign” on Jan. 29-31. Students signed a pledge card pledging to hold themselves and each other accountable for academic success. They also shared their own strategies for academic success in the classroom and how they held classmates accountable. Students were encouraged to bring other students to sign up too. Pictured is Ms. Nettles, Retention and Graduation Coach, with students during the Pledge to Pass Campaign. Each day, there was an “Academic Moment” where students learned an academic tip or policy. The Academic Moments held with the Pledge to Pass campaign focused on academic tips for success, grade replacement policy, understanding your academic transcript and how to compute your GPA. Students who had taken the pledge were entered into a drawing to win a prize at the end of each day. 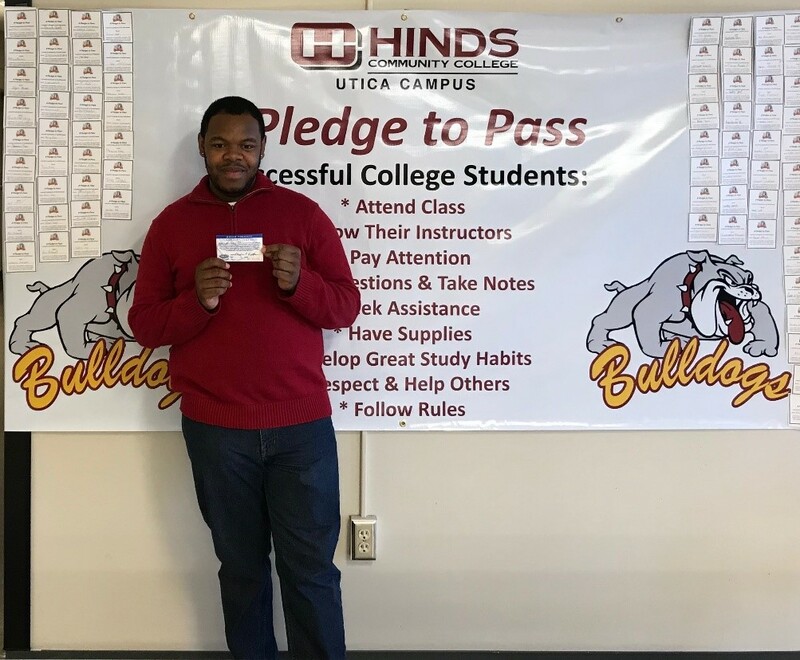 Pictured is Gregory Richards, who was the prize winner on Jan.30 and his movie pass. It is our hope that our students hold themselves and each other accountable as they PLEDGE TO PASS. 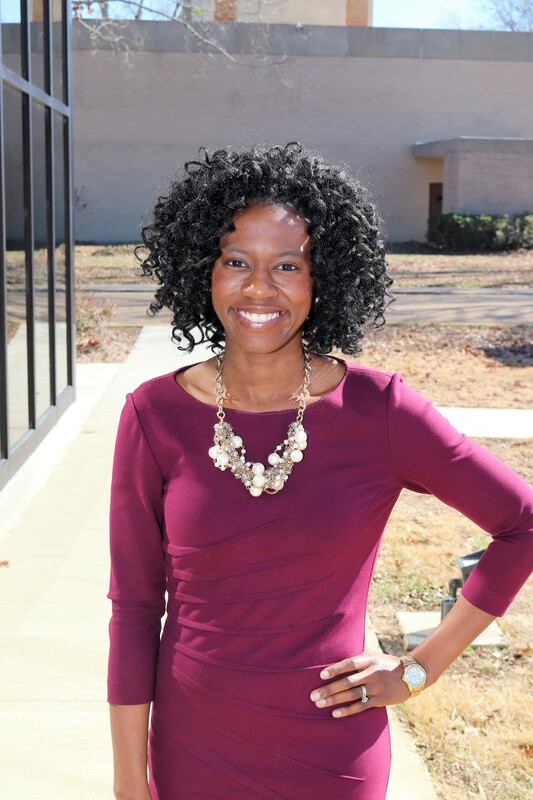 Dr. Erin Vaughn Jones serves as the director for Instruction and Intervention Equals Retention and Graduation at Hinds Community College’s Utica Campus.